Healthy U-Akansha : Eternal love- Women and Choclate! Eternal love- Women and Choclate! 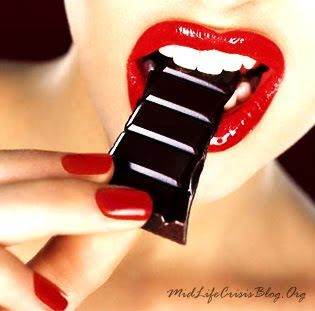 Sinful- is how women have always described chocolate!But despite this, about 99% of all women love chocolate.Ever wondered, what is it about chocolate that it is so wonderful? Its wonderful taste aside, chocolate contains phenylethylamine - the same chemical that is released in your brain when you fall in love; leading to that increase in the pounding of your heart, feeling of a sudden gush of excitement. “Love Chemical” is what some would call it. It is also believed by researcher that phenylethylamine in turn causes the brain to release mesolimbic dopamine in the pleasure centers of the brain. Nevertheless, the sweetness from chocolate also triggers the release of endorphins.The blissful feeling that you feel after eating that big bar is because of this endorphins.Perhaps that is why some women actually remarked that they felt a feeling of elation when eating chocolate. Well, a perfect gift for your love, chocolate will be. Just like buying roses during Valentine’s Day, chocolate can never go wrong. In fact, the both could be the best combination ever. Incidently, roses also contain the “Love Chemical”, Phenylethylamine. That also explains for its distinct scent. •Chocolate doesn’t have the teeth-rotting propensities of other sweets. •Cocoa in chocolate contains high amount of antioxidants-great for your skin and heart. •And lastly, its proved that women who eat more chocolates have better love life! One tip though;try and eat more of dark chocolates.....the bitter the better! hey that's great information..and so true for so many women out there..
hey thanks.something that holds very true for me.